Hi, my name is Lindsay Burley. I am currently attending the Art Institute. I've been doing 3D alters for over two years now. 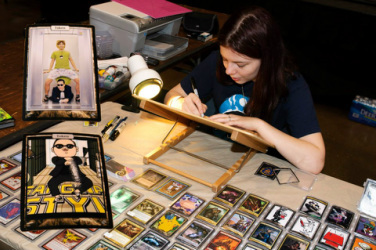 I can do any type of card; such as Magic, Pokemon, and World of Warcraft. Any card can be turned into 3D or be made into a 3D life counter. I can also do other alters as well, such as playmats and paint mods. If you would like any special commission made, just let me know! I have aquired a new website. It is www.hurleyburleyalters.com I will be leaving this site up but it will no longer be updated. 3D cards are multiple of cards to give it a 3D effect. This process has also been refereed to as shadowing. These cards are great for tokens, Planeswalker emblems or EDH generals. I am able to 3D the double-sided cards from Innistrad and Dark Ascension, they are legal to use in tournaments! Any card can be given a 3D effect. The more cards that are used the more detail I am able to put into the work. I am able to use foil and non-foil versions of the cards. I do paint-mods as well. If you are interested let me know. They start at about $20. I am also able to do custom playmats! I am able to do anything from a simple sketch to a full mat. I am now making shadow boxes. I can do them in a number of sizes the standard size that I do is 7 x 7.5 inches. These look best for the epic artworks that have a lot of depth. They normally have about 7 layers minimum.